If the correction is for the current tax year and you have not yet sent the final Full Payment Submission (FPS) for that tax year then see section A – Sending the correct year-to-date figures in the next FPS. (only from April 2019 onwards) If the correction is for a previous tax year and you have already sent the final FPS for that year then see section B – Sending a Year to Date Amendment (YTDA-FPS) return. Go to the ‘Pay Details’ screen, select the relevant employee and click on the pay period that you wish to amend. 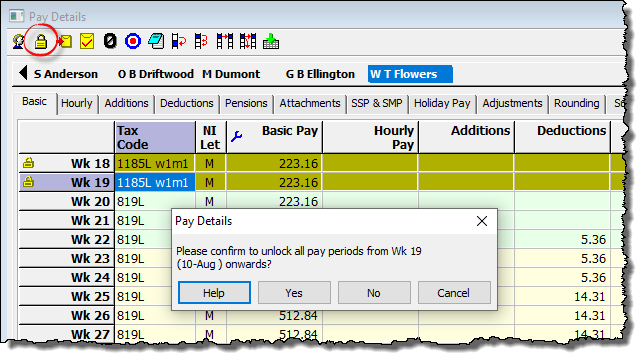 Click ‘CTRL-U’ or click the button on Pay Details toolbar and confirm that you wish to unlock this period. Make the relevant change(s) to the employees pay. VERY IMPORTANT – If you are editing a period for which the Tax & NIC has already been paid to HMRC then go to ‘Pay – Tax & NIC actually paid’ and record the amount that was actually paid to HMRC in the ‘Amount Paid’ field. This figure may be different from the ‘Total Due’ amount shown on the screen as a result of the changes that you have just made. And that’s it! When you submit your next regular RTI return HMRC will receive the correct ‘year to date‘ figures (which are sent in the underlying code of all FPS returns). B – Sending a Year to Date Amendment (YTDA-FPS) return. HMRC have changed the rules on how to correct FPS errors that relate to previous tax years, and this new rule applies to tax years 2018-19 onwards. Previously HMRC imposed a filing deadline of 19 April following the end of the tax year, and would ‘block’ any FPS sent after this date. This block has now been removed, and it is now possible to send ‘year to date amendment’ figures via an additional FPS after 19th April 2019. Moneysoft call this the ‘Year to Date Amendment (YTDA-FPS’), and this submission will be available to use in the software to amend 2018-19 figures. See our Year-to-Date Amendment (YTDA-FPS) guide for details of how to do this. If you need to correct an error for tax year 2017-18 or earlier then you will NOT be able to make this correction by using Payroll Manager. Instead you should download and install HMRC Basic PAYE Tools software and submit an Earlier Year Update to make the correction.